I like to be Milsim, with particular influence from units such as 22 SAS and E Squadron. Airsoft, Fitness Training, Bushcraft and Survival, Comedies like The Big Bang Theory and The Inbetweeners, Going out with friends and having a good time. 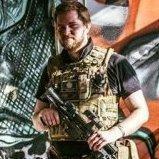 I see on the guides there is no thread dedicated to Military SOP's as such., Anyone think it could be of any benefit if I whipped one up in the next week or so for the benefit of those who want to go into milsim or generally just improve their game? I'd love to give it a real, always happy to increase the realism of everything.